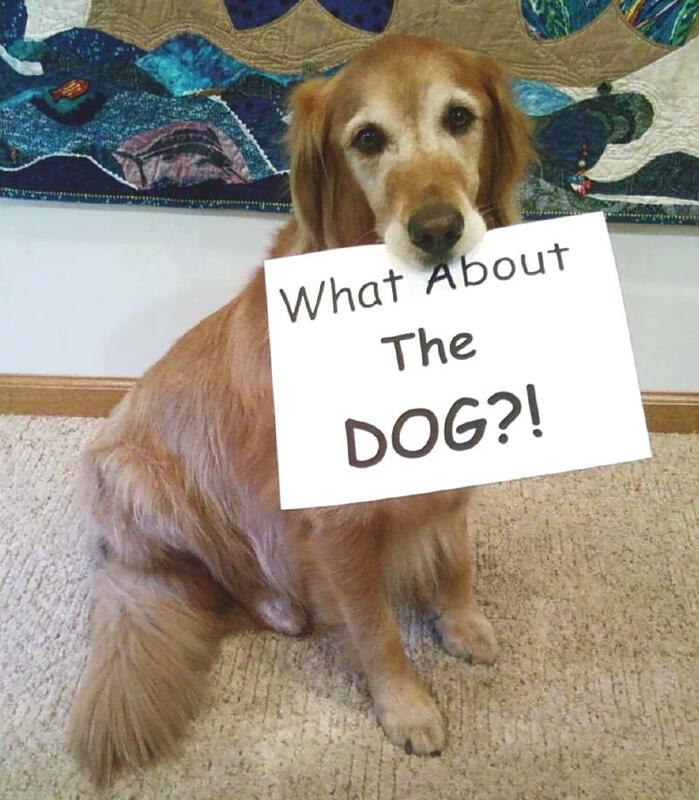 Sad Dog Gets Great Idea! I’m a sad dog. Mom left this morning for Houston and she took all the quilts with her. We were up to our tail feathers in quilts around here, so I guess that’s a good thing. She’s going to sell them in Houston (remember yesterday’s blog) so the Alzheimer’s Art Quilt Initiative can fund more research. That’s a good thing. My Nannie has Alzheimer’s. She looked right at me the other day and didn’t know who I was. Then she called me a CAT! Yeah, right, a 70 pound cat that barks! I had to laugh. It was either that or cry. Wait. I just had a thought. My brain is only the size of a large walnut, so don’t be too critical. If your people are going to Houston, please tell them to find Mom and give her a hug. Booth #5726. She’s probably missing me a lot. Here’s an even BETTER idea: All you dogs who aren’t going to Houston either, I think it would be great if we sent in a donation to the AAQI from us! 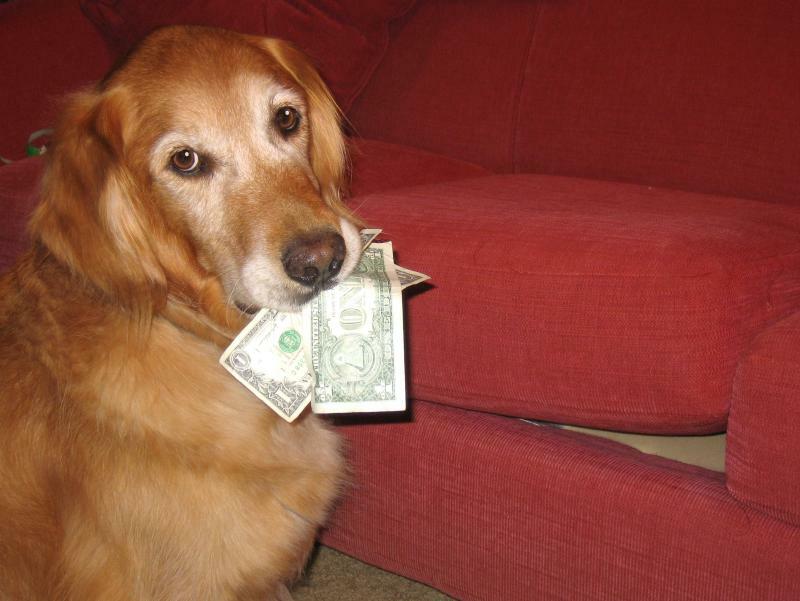 You know, Dollars From Dogs! I love it! Or Coinage From Cats! Bills From Birds!! If lizards, snakes, hamsters, gerbils, turtles, and ferrets want to join in, we can call it Animals Against Alzheimer’s! All of a sudden, I’m turning happy inside! 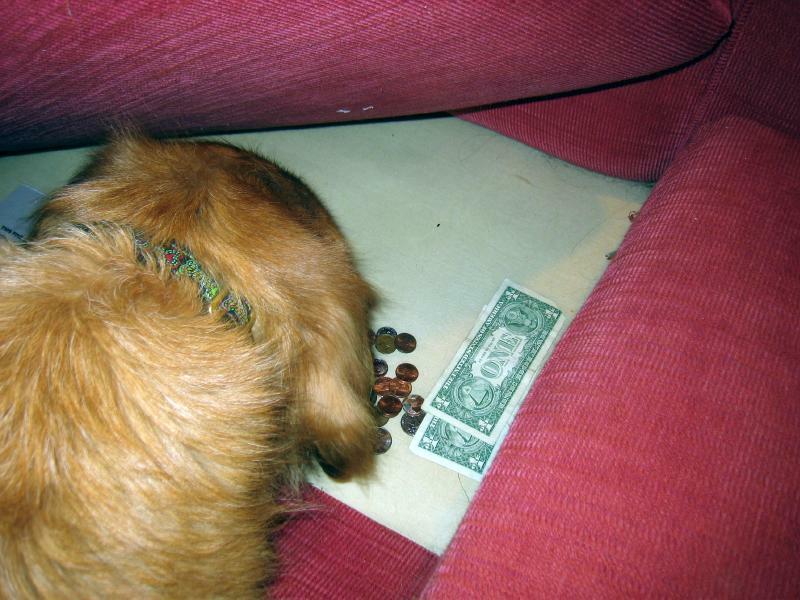 Dig around for spare change under the sofa cushions. I happened to find a few bucks sticking out of the couch and snagged them. You can see me on this video if you look really fast. Then show the money to your people. It doesn’t matter how much you find, it’s the thought that counts. They will be very proud of you, even with the slobber. The next step is to find an envelope to send the money to the Alzheimer’s Art Quilt Initiative. 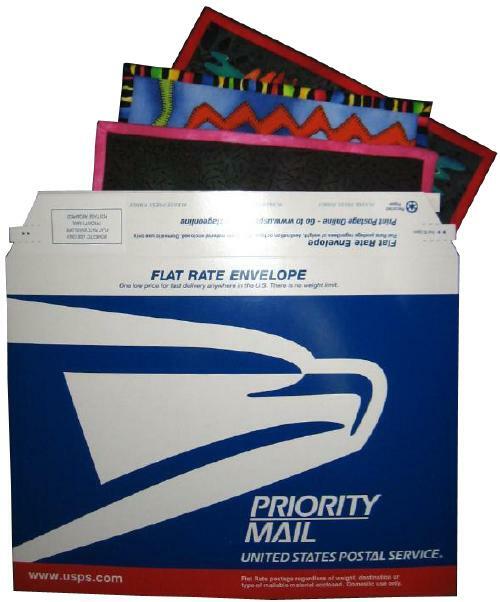 If you can address the envelope yourself it makes it easier for your people. If you don’t like sending cash through he mail, have your people send a check. 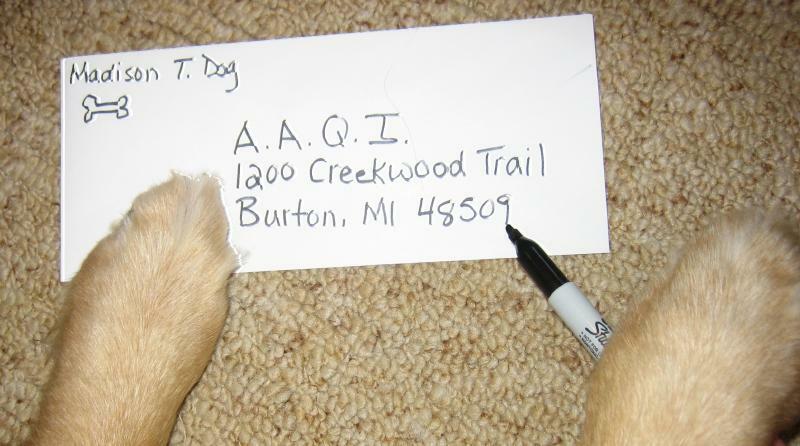 Put your email on the memo line or the envelope so the AAQI can thank you. If you don’t want to spend money on a stamp, you can have your humans make a donation through the web page. It’s tax deductible either way. Or, you can just insert it in the email and tell me to look out for an envelope from the _____ family or a check from your Mom or Dad and what their name is. A short, little something about yourself to go with your picture, including your name. Only you and your comments go on the blog. No people stuff. If you want to add a sentence of support, go right ahead. Deadline for the picture and donation is November 7th. OK animals, you’ve got your assignment! It would be really cool if we could ALL send in a little something. The more animals, the better. And remember the amount doesn’t matter. Mom got her emails down to just ONE before she left, so let’s stuff her inbox with pictures of us. She’ll like that. Start sniffing for something to send in TODAY. I will try and hold all the envelopes in my mouth for a picture, because well, it was my idea. I hope that’s OK. Thanks, everyone! Tail wags and kisses! I am particularly annoyed with Houston. I’ve never been there, but I’ve had enough of it. It’s all I’ve been hearing about for weeks. No, make that months. Some dumb quilt show. All the planning. All the packing. Suitcases everywhere. Mom isn’t paying any attention to me at all and then she’s going to leave me. It’s just going to be me and Dad while she’s living it up in HOUSTON. She gets to work all day long at some place called The George Brown. Whoever that is. I bet if George Brown had a dog, he’d stay home with it. Mom tells everybody she’s going to be in “Row Q.” I don’t know what that is either, but I bet she can’t even find it without me. And she sounds so happy about going! Can dogs pout? I’m pouting. I want to go to Houston too. It’s nothing short of amazing: a thousand quilts! I have held the work of your hearts in my hands, felt the compassion in the hills and valleys of your quilting stitches, and am humbled beyond measure that you have given your time and energy to a project, just because I asked. Yes, these quilts are small, just 9″ x 12″. But don’t let their small size fool you. In Houston, with your help, they will bring us tens of thousands of dollars closer to a cure. Come and see them. Help us sell them all! Yes, there are quilts made by “big name” quilters. And plenty made by quilters whose names you’ve never heard of. 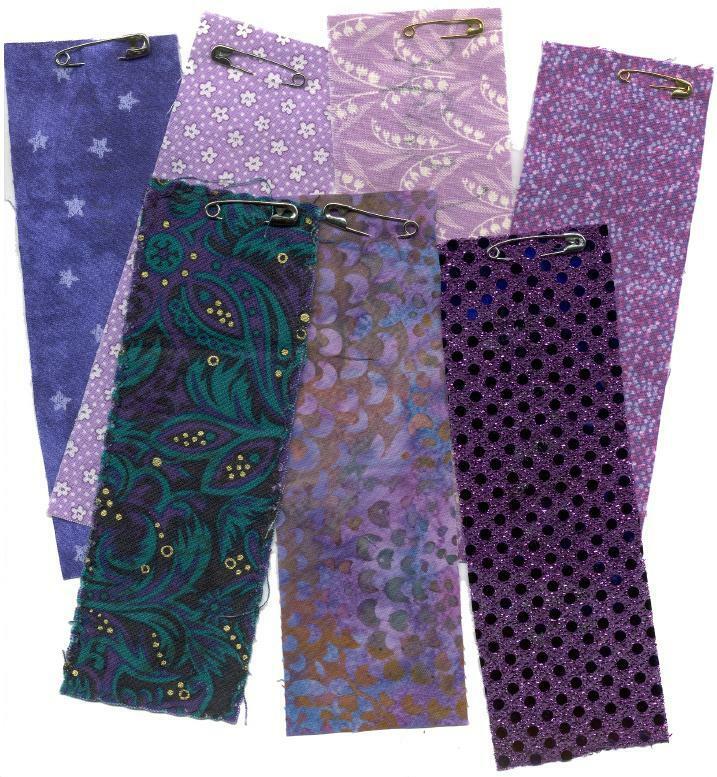 But the names that are the most important are not the names of the quiltmakers, they are the names YOU will write on 2″ x 6″ patches of purple fabric when you come and see the quilts. They are the names of people you know who have/had Alzheimer’s and we will honor them by wearing the patches in Houston. And people will ask, and we will share, and more people will understand why quilts not much larger than a piece of paper, made by people you never heard of, are important. We have purple patches here for you, markers too. We have some patches with names already on them if you are lucky enough not to have a name to write. Keep your purple patch or bring them back to the booth on Sunday afternoon. Your patch will be used in a Ceremony of Remembrance or stitched into a quilt like the one shown here. Please share this message with as many people as you can. The Alzheimer’s Art Quilt initiative will be in booth 5726, Row R. All profit funds Alzheimer’s research. I Like A Machine That Does EVERYTHING! I love sewing machines. They’re the ultimate gadget as far as I’m concerned. And they keep coming up with such great advances like needle down, knee lift, stitch regulators, embroidery modules, and bobbins that chirp when you run out of thread. And the FEET? What about the feet? I’ve got more specialty feet for my Bernina than I have shoes. I love it! Name the task and I’ve got the foot! Or the attachment! Now here’s a Kenmore (pictured above) that has a feature that is apparently so popular that it’s built right in! Norma Sterbenze was cleaning out boxes in the basement when she found the original advertisement for it (some 20 years ago) in the Kansas City Star. 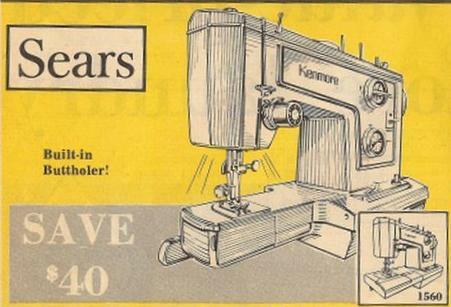 Click on the photo and look at the small print on the left hand side below the SEARS and above the SAVE $40. I’m just glad it’s built in because I certainly wouldn’t pay extra for it! What’s the best feature on YOUR sewing machine? Take the poll! Quilters (and their husbands) Are SO Creative! Check out this awesome idea for raising a regular 8-foot backbreaker into an appropriately-tall workshop cutting table! It’s just as stable as chunks of PVC pipe or bed risers for each leg, and it already comes with the room! Plus one doesn’t even need a buddy to help set it up. As long as the table has the kinds of legs pictured here and the chairs are the garden variety metal folding type, you’re in business. This idea came from Sharon Jack’s husband, Ron. I saw it in action when I visited the Decatur Quilt Guild last month. Use this idea at your own risk. Lifeguard not on duty. Close cover before striking. Individual mileage may vary. For external use only. Do not use while sleeping or unconscious. Not intended for highway use. And other serious warnings. I do a Sudoku puzzle or two about every day, mostly because I can’t just sit and do NOTHING. I have my favorite pencil that spits out the lead automatically (no twisting, pushing, clicking—it just KNOWS when I need more lead) and I have a go at it. I have my own peculiar way of approaching Sudoku: I don’t write down options of what each box COULD be, that only confuses me. I try to find three down or across either “in order,” first all the 1’s, then the 2’s, etc. or if I notice a bunch of one number then I’ll do those first. When I’ve got all nine of a number I write that across the top so I know not to look for those any more. And, I’m trying to “notice” what is missing without counting. If I make an error I don’t try to fix it, I scribble over the entire puzzle and start a new one. This has been the most difficult part, letting go. And not scribbling too hard. I’m not good with failure; it really bugs me. There could be a lesson here in learning not to dwell on mistakes but rather moving on and realizing in the whole scheme of things life does continue if I put two 7’s in the same box. That was hard enough to learn playing a game. Real life? That’s quite another thing. And in quilting (also a part of real life) I’m not a happy camper until I FIX the boo-boo and get at least one tiny step beyond where I was when I discovered it. 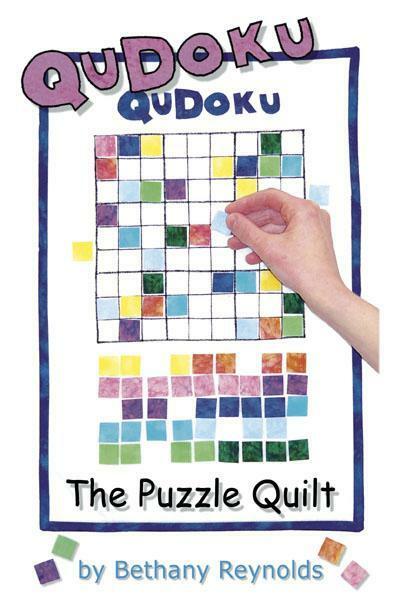 My friend Bethany Reynolds created a Sudoku quilt pattern called QuDoku that uses colors and no numbers. Brilliant! If you’d like to try Sudoku, find a friend to show you how so you understand what the object of the game is. Then, there’s a wonderful web site where you can print off “free” puzzles. (In quotation marks because a small donation would be appreciated.) They’re here! If you enjoy them, think of me. If not, please don’t.